← Come on in, the water’s fine. Want to see the wells causing more than a foot of subsidence at Check 20 of the California Aqueduct? 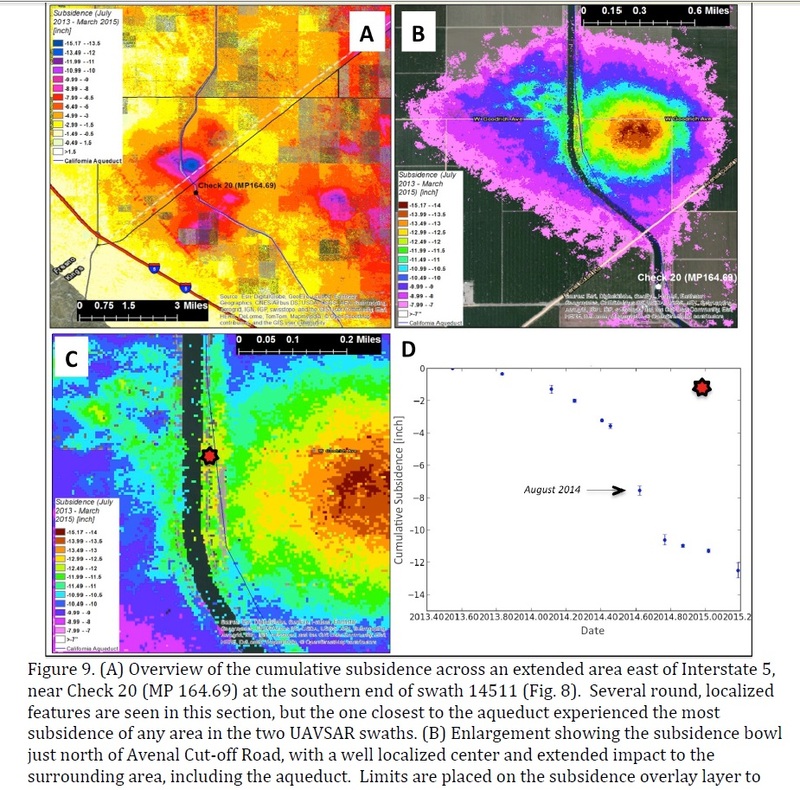 I was reading through JPL’s Progress Report on Subsidence in the Central Valley. I gather they’ve made some real good progress, and with successive satellite passes can get good measures of subsidence in the Central Valley in the past few years. Figure 9 caught my eye. That’s a small, localized subsidence bowl, threatening the California Aquaduct. I wonder what they are pumping that water for? So I went over to Google maps. Of course, almonds. It isn’t a confusing picture. There are quarter-section almond groves, with wells in the middle, right there in the center of the foot of subsidence. We can look at them a little closer. There isn’t a street view of the intersection of Orange Ave and unnamed road. But a half mile away, at Orange Ave and Avenal Cut-off Road, there are two more wells inside the subsidence bowl. The street view catches those neatly. Here they are on both sides of the street. I am surprised at the run-off along Orange Avenue. I usually assume that irrigators do a better job. That was 2013, so this drought was a couple years along. I didn’t go to the Fresno County Assessor’s office to check whether those half-sections all belong to the one farm that is named on the Google map. But it is likely that they do. If so, this is a clean example of one groundwater-pumper to one piece of threatened infrastructure. The subsidence bowl (a foot of drop in two irrigation seasons, not including the 2015 irrigation season) is isolated, centered on readily identifiable wells that very likely have one owner. If work is required at Check 20 of the California Aqueduct, that owner alone is liable for, and should pay for the entire cost of those repairs. The State Water Contractors are a sophisticated organization with good lawyers. As DWR and the State Water Contractors “develop a capital improvement program to repair damage from subsidence”, their lawyers will no doubt tell them that with JPL’s InSAR data, they may be able to recover costs from some of the pumpers who broke their canals. I would understand if farming districts do not want to broach this and would rather spread costs evenly throughout the contractors. But if municipal districts try to pass these costs along to their ratepayers without first trying to recover from the pumpers who are liable for them, they would be violating their fiduciary duty to their ratepayers. If I were the Fresno County Department of Public Works, I would have already requested all of JPL’s InSAR data as a GIS file. I would be matching those subsidence maps up to broken bridges, roads, canals, gas lines and rail lines this very minute. They’ve already got the parcel maps to identify well owners. Fresno County owes it to their taxpayers to look for the wells causing subsidence causing infrastructure damage and try to recover repair costs. Caltrans owes all Californians the same effort.